Trump delivered his first State of the Union address a year after completing his one-year term. 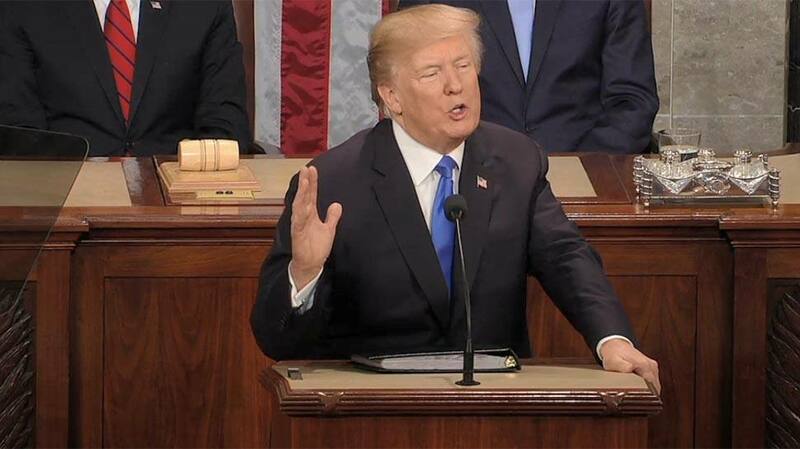 United States President Donald Trump delivered his first State of the Union address in Washington DC on Wednesday to a joint session of the United States Congress. The speech comes a year after the president completed his one-year term. The people dreamed this country. The people built this country, & it’s the people who are making America great again...Our nation will forever be safe & strong & proud & mighty & free! Trump remembers Otto Warmbier and his honours his family. The first pillar of our framework generously offers a path to citizenship for 1.8 million illegal immigrants who were brought here by their parents at a young age. The third pillar ends the visa lottery -- a program that randomly hands out green cards without any regard for skill, merit, or the safety of our people. It's time to move towards a merit-based American system, who'll love our nation. Tonight, I am calling on the Congress to finally close the deadly loopholes that have allowed MS-13, and other criminals gangs to break into our country. The era of economic surrender is over. We will protect American workers and American intellectual property, through strong enforcement of our trade rules. Many car companies are now building and expanding plants in the United States -- something we have not seen for decades. They are roaring back. They want to be in the United States of America. Last Congress passed the landmark VA Employment act. "Sharp introduced us to the FandFchallenge. His efforts have resulted in the placement of more than 40,000 American flags and red carnations on our soldiers’ graves. Thank you Preston for joining us at this year’s"
This is our new American moment. There has never been a better time to start living the American Dream. So to every citizen watching at home tonight -- no matter where you have been, or where you come from, this is your time. 3 million workers have gotten tax-cut bonuses. "As we rebuild America’s strength and confidence at home, we are also restoring our strength and standing abroad," said Trump. 2.4 million new jobs created last year. After ages, we're seeing rise in wages.